Whereas the computer studies curriculum for years 12 and 13 is strictly regimented by the Samoa Ministry of Education and the South Pacific Board of Education respectively, there are very little guidelines for years 9, 10, and 11. At the beginning of the year, the computer teachers in the Congregationalist school system got together and decided on a game plan for each grade level. That said, beyond the written test there’s very little in the way of quantifying the progress my year 10s have made. But today they were amazing. I only see the year 10 classes once a week and the classes are huge, which means they get very little time with the computer. The last two times I’ve seen them, they were given assignments with loose parameters in which they were supposed to use Microsoft Word to write about the Road Switch and their week on holiday. Feeling increasingly guilty about not “teaching” them anything, I decided I should change it up this week and have them work on something with more structure. 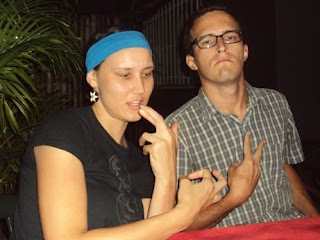 I gave them the equivalent of a digital worksheet in which they had to go through a list of menial tasks—e.g. cut this, paste it here, make this bold, change the font, etc. That term “menial” is relative; most readers of this blog could finish the sheet in 5 minutes or less, but to 14-year-old kids who are working with a computer for the first time in their life, it can be quite challenging. I gave the classes the same assignment a couple months back, and there was some slow going. We take copying and pasting for granted, but it’s kind of an abstract concept. And while Microsoft Word’s auto-select feature is a convenience for seasoned users, it’s frustrating for beginners. And when you try re-selecting the text immediately after you’ve mis-selected, it moves the text, and the whole page is thrown out of whack. I’ve seen some pitiful cases. But I think the loose approach of the last few weeks has allowed them to grow a little. I have no quantifiable data, but today their command of the mouse and navigating the program seemed much better. Walking around I saw them selecting specific phrases rather than entire sentences. They were scrolling through the fonts menu with ease. I was called in to undo bizarre missteps far less frequently. I should qualify this. First, I saw the two top year 10 classes today. The 10.3 and 10.4 classes have yet to prove their progress. Second, there was a lot less chaos at each workstation in part because I split each class into two “heats” so there were only two students on one computer at a time. In the past ,they were working with three students to a computer, which can get confusing. The smaller numbers may explain the progress. I’m still a big believer in the Loose Approach. When I taught swimming lessons, I used to have my tiny tots push off the wall and “swim” out to me as best they could. They’d flop around a while and panic a little and the moms in the bleachers would get nervous, but after a few times, natural instincts would kick in, and they’d be able to swim 5 or 6 metres. And I feel like that’s what I saw today. 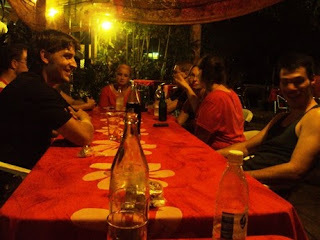 PCVs at Koa's birthday party at The Curry House. Always surreal seeing Union City in new places. 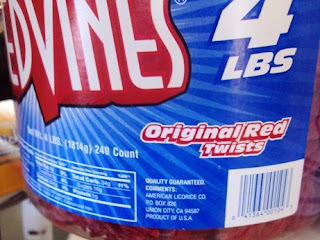 This tub of Red Vines was sitting next to the check-out line at Farmer Joe, a product of the American Licorice Co. 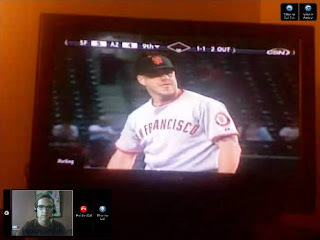 I Skyped Luisa on hi-speed internet tonight, and the connection was good enough that she could point her camera at the TV, and I could watch Giants baseball in real time. And they won. now I'm going to look at every Redvines box for Union City. So much to say. Ouch on the Giants...I never give up until they are mathematically out but ouch anyway. Very fun that you got to see them though.